I was having a conversation with a couple of friends recently about books, and one of them asked me to recommend something light and funny. To my surprise, I found that I really couldn't; it's been such a long time since I read something like that and enjoyed it. The last time I attempted something along those lines, I ended up reading Nick Spalding's Fat Chance, which was without question one of the worst novels I've ever bothered to finish. 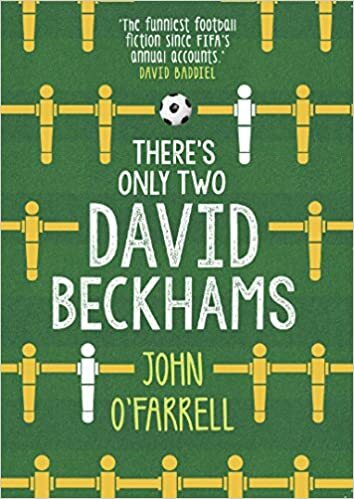 When I spotted John O'Farrell's There's Only Two David Beckhams in the Inverness branch of Waterstones while I was away this weekend, however, I remembered how much I enjoyed some of his other novels and thought this might also be entertaining. Plus, I'm starting to get excited about Euro 16 now (we've had a wallchart up in our house for a week already and I've booked the day off work for our game against Wales) and this is a book about the England football team. More specifically, it's about an England football team of the future that might - just might - be good enough to win the 2022 World Cup. When a relatively mediocre sports writer - more like, as his opposite number on another newspaper observes, 'a fan with a laptop' than a journalist - discovers something about the team that could be the biggest scoop of his life, he's torn. Alfie could reveal the team's incredible secret and break the football story of the century ... but that would mean they're disqualified from the tournament on the eve of the final. As an England fan, can he bring himself to scupper their chances? My only real gripe is that Alfie's world seems to be one in which only men like football. His former partner leaves him partly over his devotion to the game, his flatmate dumps his girlfriend because she whines about having to watch a game at the pub, etc etc. I appreciate that this is largely a book about men and male relationships, which is fine and O'Farrell does this very well, but it's possible to explore that without the women being either long-suffering, sensible types who think liking football is childish, or whinging girlfriends who can't put up with 90 minutes of the national team on television once in a while. In fairness, this was a very small element of the book, but it was sufficiently noticeable for me, as a woman who likes football (and is every bit as unambitious and easily distracted as Alfie, too; I can never identify with the smartly decisive women who always seem to be being brisk and capable in books like this) to be a little grating. This is only a tiny issue, though. Overall, There's Only Two David Beckhams is a light, easy, feelgood read. It's extremely funny and has plenty of pace; it really did keep me turning the pages. John O'Farrell is a clever, observant writer and this is the perfect warm-up read before Euro 16 kicks off.